I left mobile development in the far 2010, when Salesforce development became my actual job. In the past 6 years I've gradually switched to web dev techs over native development, and this a kind of hurted my feelings, but it was a necessary path (I merged the passion for discovering new techs with learning something usefull for my "giving-money" job). Few months ago I made up with my team a quick demo for a client using PhoneGap and the Salesforce Mobile SDK: it was really amazing, we created a fully working app (I'm not the wizard of UIs, but it was pretty amazing) in a couple of weeks. With the new release of the Mobile SDK we have a unique set of interfaces shared between all platforms to link your app, so you don't have to think to which feature you can use and which not, and dedicate your time to develop your awesome app in your preferred platform. Here it is a link to the Mobile SDK Release Notes. 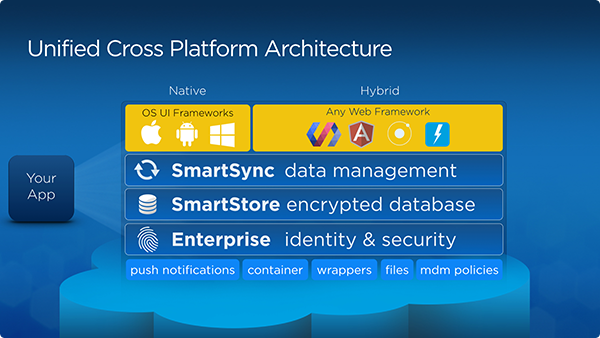 SmartSync for native and hybrid development is (in my opinion) the coolest utility feature in this release: this grants a common set of complete API to talk to the SmartSync layer, to ptimize data access when storing objects or doing cached queries. This allow you to develop responsive and high qualities apps that work perfectly is an offline mode as well as online mode, creating a caching layer and a conflict resolution control. The following is a cool mini-tutorial on how to detect conflicts when managing offline data while the details of the SmartSync usage. For a complete example jump on this tutorial. This framework is getting new features release after release, and if you haven't join our developer community and start build awesome apps!